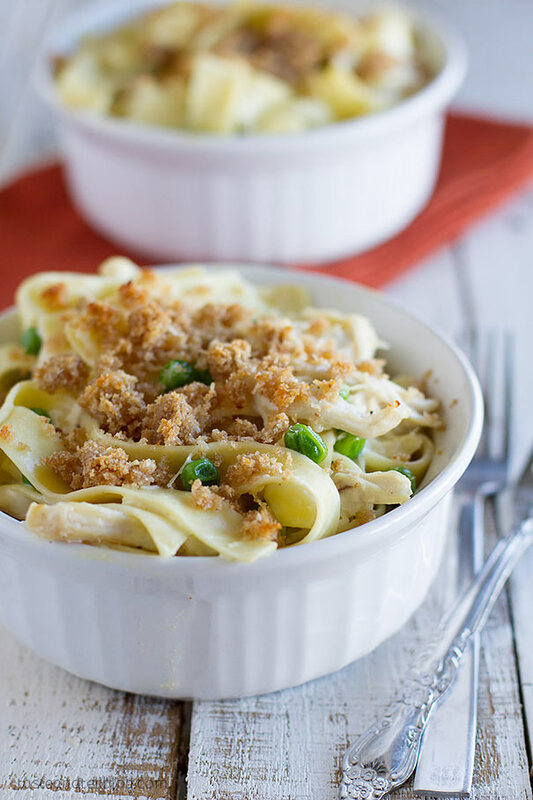 This Garlic Parmesan Chicken Pasta is made easy by using precooked, shredded chicken. A garlic parmesan sauce coats the chicken and homestyle noodles in this fast and comforting casserole. I am going on 4 weeks of no car. 4 weeks, you guys. I never realized just how reliant I am on a car until I don’t have one anymore. Luckily, I’ve been able to get out a few times – even if it has just been 10pm runs to the grocery store. But I think my kids are getting cabin fever. My daughter has school (and luckily rides the bus), so she hasn’t been that bad. But my boys? I think we are definitely in urgent need of an outing. Seriously – most days we don’t even have a reason to get out of our pajamas. Luckily, next week the car will be back (with a brand new shiny transmission. Yeah, right before Christmas. Perfect timing, right?) I told my husband that I’m not making any plans for Tuesday and we are driving up and down the valley, doing everything and nothing, just because we can! The good thing about being homebound, though, is that I’ve been keeping busy and trying to be super productive. And part of that has been trying lots of new recipes. 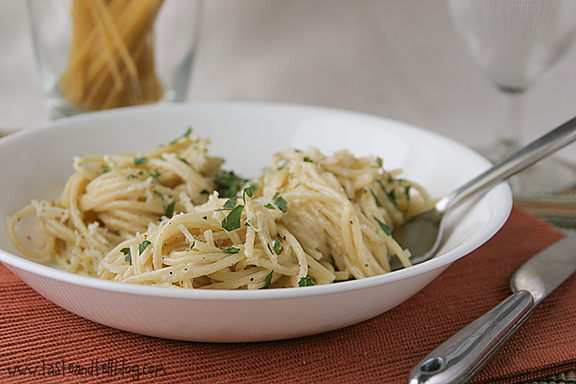 Which has included this Garlic Parmesan Chicken Pasta. 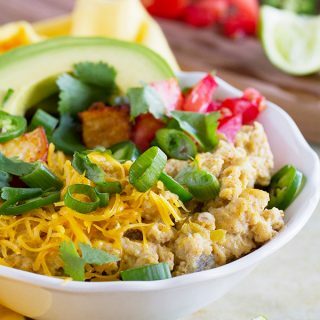 You all know that I’m a fan of using leftover shredded chicken (check out these 24 ways to use shredded chicken!) 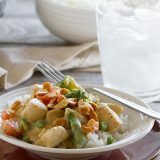 This recipe is a great way to use that precooked chicken, which makes it perfect for an easy, fast weeknight dinner. I used some homestyle noodles that I had in my pantry, but you could easily substitute some wide egg noodles as well. And this makes enough Garlic Parmesan Chicken Pasta to feed an army. 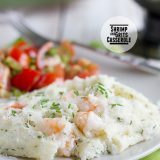 I purposely made a ton so that I could have leftovers, but feel free to cut the recipe in half if you only need 4 servings. And I love to serve pasta dishes like this in individual serving dishes, but you can definitely throw it all in a casserole dish! 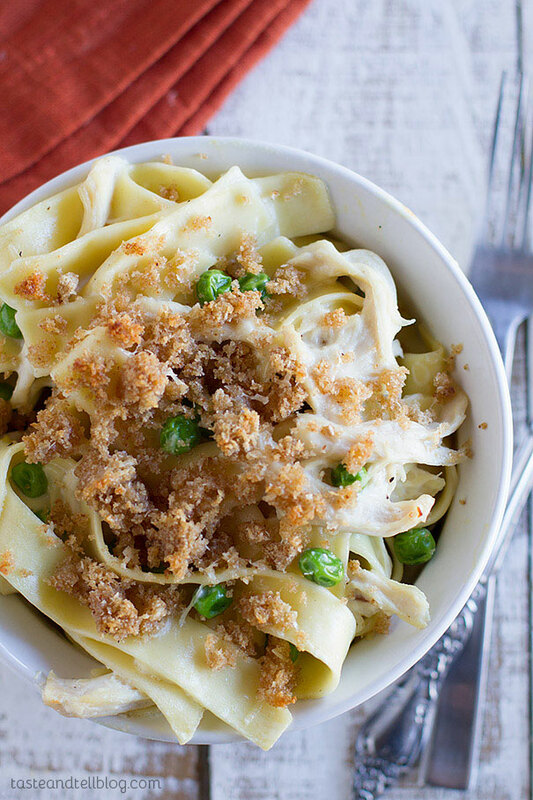 This Garlic Parmesan Chicken Pasta definitely belongs on your go-to weeknight dinner list! 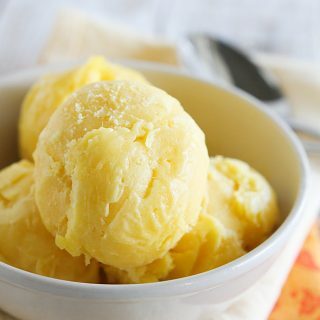 Meanwhile, melt the 2 tablespoons of butter in a large skillet over medium heat. Add the garlic and cook until fragrant, about 30 seconds. Stir in the flour and cook for 1 minute. Gradually stir in the milk and cream, then cook until it gets thick and bubbly. Stir in the chicken, peas, and half of the Parmesan. Stir in the noodles, then set aside. Tear the bread into pieces and place in a blender or food processor. Pulse until coarse crumbs form. 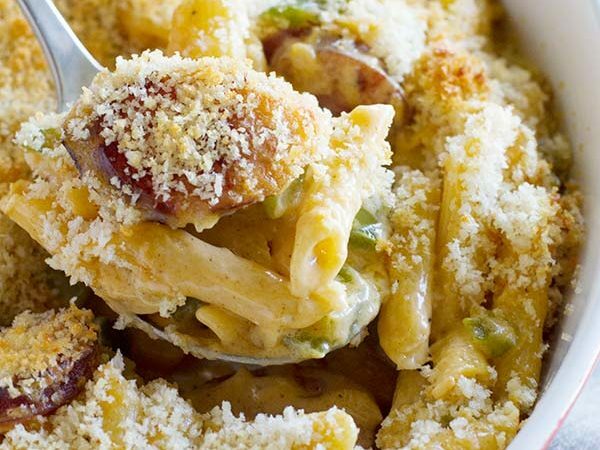 Pour the crumbs into a bowl, then add the remaining Parmesan and the melted butter. Toss to combine. 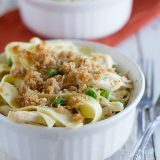 Divide the chicken and noodle mixture between 8 16-oz ramekins, or pour into a large casserole dish. Sprinkle with the breadcrumb topping. 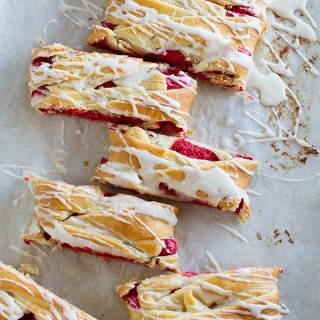 Bake until the topping starts to brown, about 10 minutes. OMG 4 wks without a car would not work for me where I live. Recently I was without for 4 days. Grabbing rides everywhere to get to work and home again. Well great that will soon change. 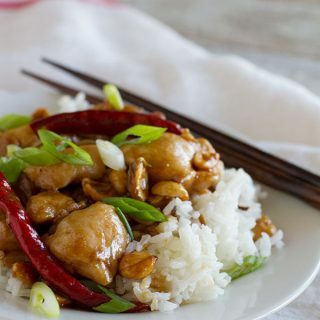 Great hurry up dish with a lot of flavor. 4 weeks?? That sounds terrible! Its snowing here, I would be lost without my car. Hope its fixed this week and you don’t have any more issues with it. 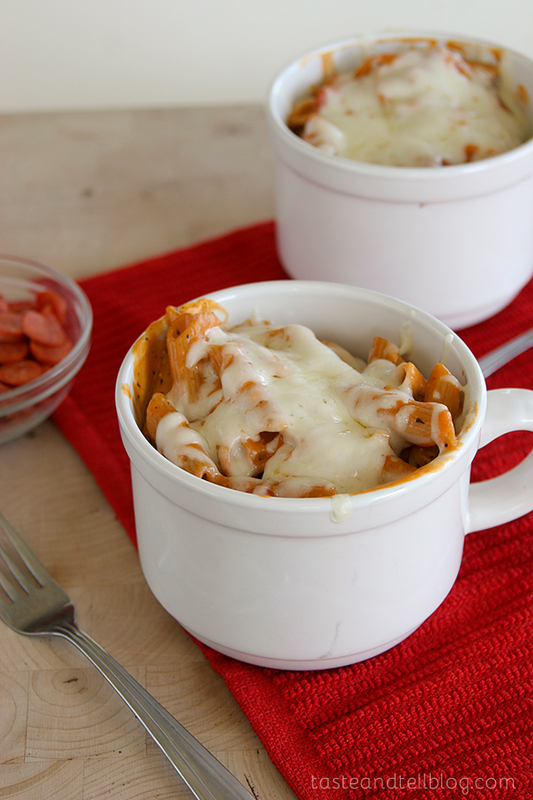 This looks delish, my kids LOVE pasta! This is why I insist on living somewhere where I can walk everywhere! I would definitely go crazy if I was trapped inside. 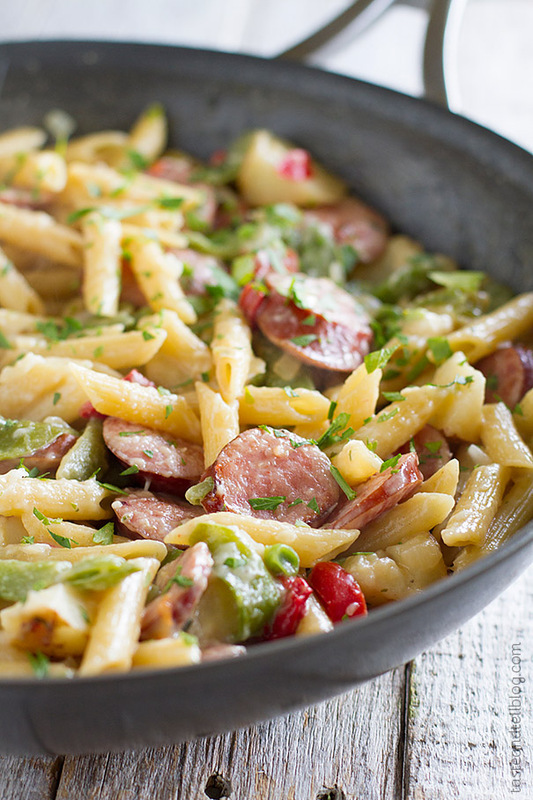 Love this creamy pasta goodness. 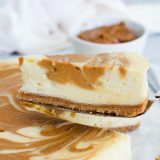 This looks delicious and so comforting!